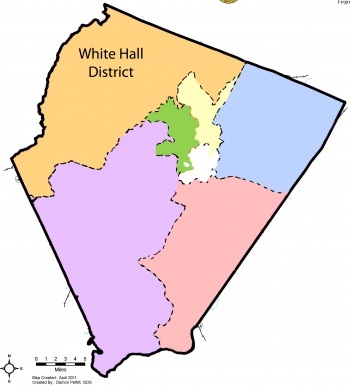 The White Hall District is one of six Magisterial Districts in Albemarle County. Ann Mallek (D) was elected on November 6, 2007, defeating incumbent David Wyant by 603 votes.. The planning commissioner is currently Jennie More. David Oberg is the School Board representative. ↑ 1 - County code: Sec. 2-106 White Hall Magisterial District. This page was last edited on 18 November 2018, at 23:48.